Josefina Báez, a performance artist, instructs students of Spanish 126: “Performing Latinidad” in a spontaneous expressive performance in front of the John Harvard statue in March. 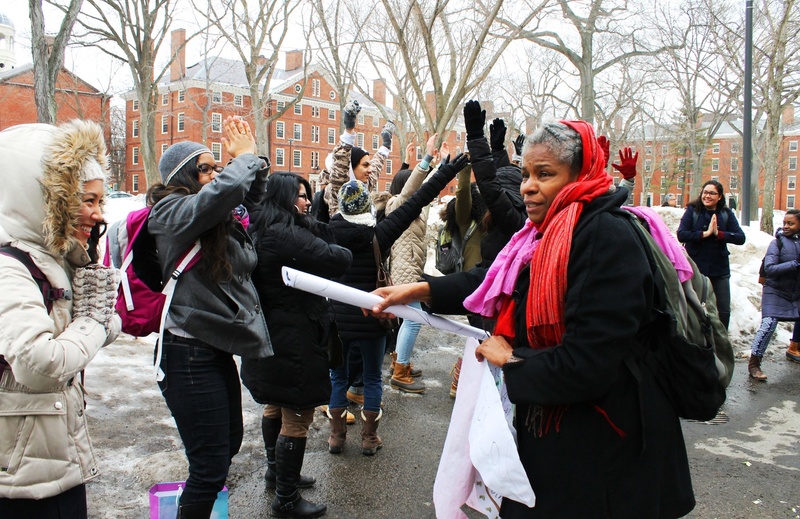 UPDATED: March 6, 2015, at 12:46 a.m.
Students in Spanish 126: “Performing Latinidad” processed around Harvard Yard on Thursday morning, hanging signs and quotations on trees and reciting poetry and prose. Through their words and gestures, they sought to discuss issues of identity and to bring the texts from their class to life. “The words were in the theory and the poetry, and we took them outside,” performance artist Josefina Báez, who directed the class in its performances, said. “Latinidad” refers to the shared experiences of Latinos, according to Lorgia H. García Peña, an assistant professor of Romance Languages and Literatures who teaches the course. García Peña said that, for Thursday’s performance, her students formed six groups, with each picking a campus location that it considered important as a living or educational space. The class, at one point, was led by two students holding a large sign featuring pop artist Jennifer Lopez, which they subsequently placed in front of the statue of John Harvard with a lit candle. Báez invited members of the class to take pictures with the installation. Inspiration for the poster came from an article on the influence of the image of artists like Lopez on perceptions of Latinos in popular culture, García Peña said. After the stops around the Yard, the class convened in Boylston Hall to perform the last projects, using dance movements and accompanied by a guitar. Due to an editing error, an earlier version of this article misstated the gender of Lorgia H. García Peña. In fact, García Peña is a woman. Also due to an editing error, an earlier version of this article misstated the day of the event. In fact, it took place on Thursday. Harvard University will create a new fellowship for students in Chile to pursue graduate degrees at Harvard. Vonnegut lampooned the world’s absurdity for me, Fuentes laid the sometimes-sordid foundations of power bare to me, but Gabriel García Márquez taught me how to dream. I’ve always liked books more than people; I think they stay with you longer, inhabit a deeper part of your brain. Read more. Don’t be afraid to. Two administrative fellows and one graduate assistant are spending the academic year in the Office of Student Life to implement College diversity initiatives.